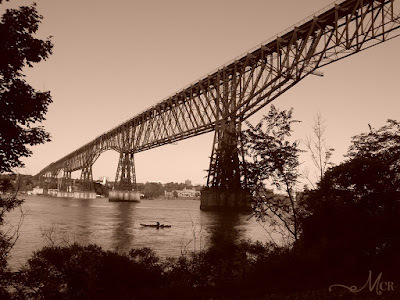 The Walkway Over the Hudson State Park celebrated its official Grand Opening with ceremonies befitting all of its former glory as the 1888 Highland-Poughkeepsie Railroad bridge, a key link from the northeast to the west for products and passengers and in the war years, for troops traveling east to bases on the Atlantic coast. The walkway is the centerpiece of the Quadricentennial Celebration, honoring explorer Henry Hudson’s voyage to the river in 1609. On Friday evening a Grand Illumination of the Walkway was held with a 1,000 points of light lantern release, followed by a fireworks display between the Walkway and Mid-Hudson bridges. On Saturday, Gov. David Patterson arrived on the Highland side of the bridge to officially dedicate the structure as the 179th state park. It will be operated by the Office of Parks, Recreation and Historic Preservation and will be open year-round, weather permitting, from dawn to dusk. The bridge, at 1.25 miles, is now the longest pedestrian bridge in the world, and stands 212 feet above the river. The Governor made note of the unique partnership of private/public funding of the structure that made the rehabilitation possible. Ultimately the state contributed $18.7 million toward the $38.8 million final cost. Patterson also thanked U.S. Sen. Chuck Schumer (D-N.Y.) and Congressman Maurice Hinchey (D-22nd District) for their early support and efforts in securing funding. Along the way state dollars were matched, starting with a $2 million gift form the Dyson Foundation, $1 million from Scenic Hudson, $500,000 each from the Jane Nuhn Foundation and from the Dutchess County Industrial Development Agency, $400,000 from Save America’s Treasures and nearly $1 million from other area foundations, corporations and individuals. Gov. David Patterson [N.Y.] at Walkway opening. Patterson said that when he was a very young student his teacher once asked the class for the name of Hudson’s boat. The closest answer was the quarter Moon, and no one correctly responded with the Half Moon. The governor’s wife, Michelle Patterson, has been the honorary Chairperson of Hudson-Fulton-Champlain Quadricentennial Commission. Schumer said the bridge will prove a unique attraction for the area. “The Walkway Bridge is poised to become one of the greatest and most innovative tourist attractions in New York State and across the country that will draw visitors from all over the world, delivering millions of dollars to the Hudson Valley region for years to come,” he said. Hinchey said this bridge has risen from the ashes of a fire in 1974 that ended any further rail service. Assemblyman Frank Skartados said there is a tangible feeling in the air, now that the bridge is complete. Robert Dyson is President of the Dyson Foundation. Fred Schaeffer, who chairs the Walkway Over the Hudson organization, has been waiting for this day for more than a decade and a half. In his self-effacing manner, he deflected the praise to those whom he feels deserve the real credit. 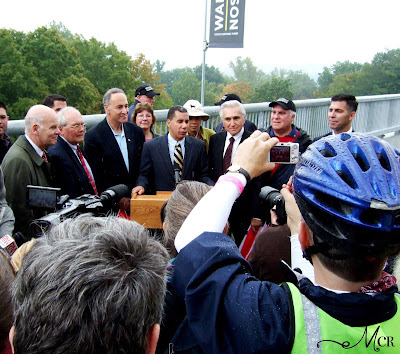 After these official comments, an inaugural opening of the gates on both sides of the river commenced and, by invitation, a small crowd gathered at the center of the bridge to witness a ‘Tying of the Knot’ ceremony with Poughkeepsie Mayor, John Tkazyik, and Lloyd Supervisor, Ray Costantino. The Walkway Board of Directors and the Firemen who fought the 1974 blaze, which saved the bridge from complete destruction, were also officially thanked for their efforts. A ‘Walking on Air’ parade followed with puppets and flags representing all of the towns in Dutchess and Ulster Counties. On Sunday a 5K run by the Mid-Hudson Runners started the day, followed by the a music festival held at the Bob Shepard Highland Landing Park and co-hosted by the Clearwater organization and the Hudson Valley Bluegrass Association. Cruises were offered to the public and the Arm of the Sea Players presented a puppet show depicting the history of Hudson’s voyage to the New World and to the river that now bears his name. Dyson said that for the residents of the region, this Grand Opening Weekend was a once-in-a-lifetime experience that will be passed down by word of mouth from generation to generation. He added that this project began at the grass roots level, even attracting the attention of a young student named Christian McGraw.